The Healthy Hoff: Hair RePear To Stop Dreaded Frizz! What the hell have I been doing to my hair?!? I firmly believed I was cursed with a frizzy mess for hair; hair that could only be tamed by heat and dominance. Only to find that that’s not my hair at all and that I’ve been abusing it all these years! I ALWAYS wrapped my hair in a towel after washing, because that’s what all the commercials and ads said to do. Then I got grown up and I bought the fancy smancy microfiber hair turban in fancy smancy colors and thought I was alllll cool. Nothing but lies all these years and my hair has paid the ultimate, unfair price. Whether your hair is curly or straight, wavy or not – a t-shirt is all it takes to prevent frizz & damage. Yes, you heard me correctly, A T-SHIRT! So freaking simple and it’s been in my wardrobe my entire life! Yes, you could use a straight up t-shirt, but how do you wrap it and hold it in place and what about the sleeves and the pockets and the graphics, yadda yadda. 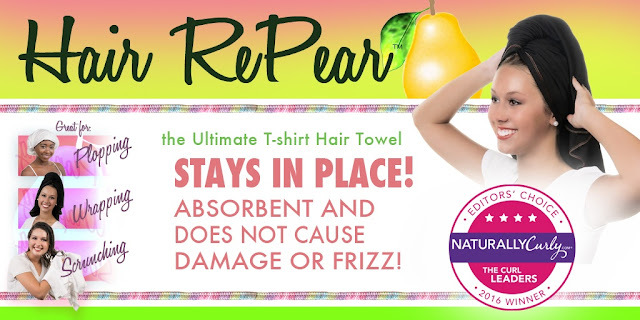 Save yourself the hassle and invest $20 for your hair peace of mind and get yourself the Hair RePear T-Shirt Towel! Made from the finest premium quality 100% Cotton Interlock Fabric available right here in the USA! The Hair RePear ultimate t-shirt hair towel is designed to be large enough for wrapping, scrunching, and plopping/plunking (if you don’t know what this is, check out YouTube, it will blow your mind!). There are two sizes - 29x45 for long hair and 19x39 for short hair. I will say I went for the larger size and it’s a little too big – but I’d rather have too much fabric than not enough. Also, this little wonder towel comes in two colors – white & black. After reading many reviews, I opted for the black; as the white didn’t look so great after freshly dyed hair. You could buy directly from Hair RePear, but you know me, Amazon is where all the cool peeps shop! How much better would you say this method works? Much much much? Or just a tich better? I'm going to try this tonight and just use a t-shirt on hand, since it's what's available. I guess I may know more tomorrow. My hair is big and frizzy and it's not even June yet.